Elkagorasa the Casual: Elkagorasa is Closing in on 500! Elkagorasa is Closing in on 500! 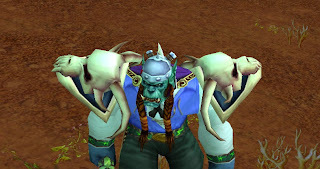 6 4 years ago when I started this blog to track my warlocks "Adventures in Azeroth", I never really thought it would have lasted this long. It was a passing fancy to work on while at the office. Sort of a mental not of things to do when I get back online. As of this post, I'll be a short 4 posts away from 500 blog posts. Ok, to be honest, it's not like I can came to compete against my warlock compatriots who love to write. I have been know to do the 10 word post that includes an interesting screenshot. All I have to say is 'thanks for coming back'. On other 500 news, Elk now has a 499 gear score. Not 'bad' considering back in January, Elk was sporting 460s. 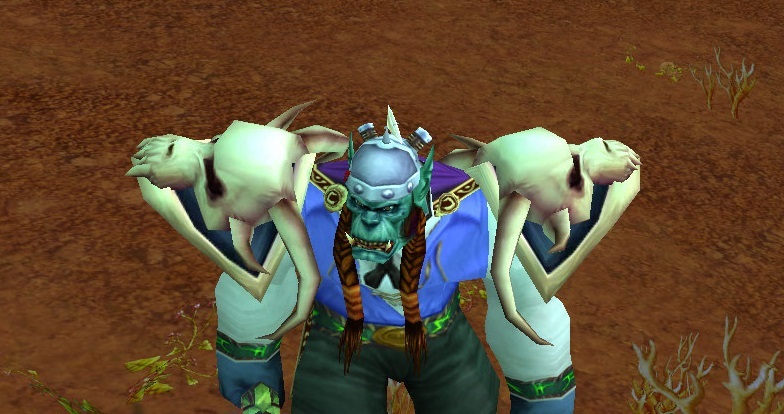 While out working on the new 'Battlefield: Barrens', I picked up an interesting random drop, Latent Kor'kron Spaulders. Combine this drop with the Radical Mojo from the new 'weekly', and I'll get something mildly (i483 vs i489?) better than the warlock tier set that I have already. I found a random group was killing commanders. No need to invite, just whack at it how ever you got. When done, you'll be able to loot somewhere around 30-40 of all 4 resources your are gathering. I had all 150 within an hour (skipped raid invite when it popped). I now have a Perjurious Mantle of Unerring. I'd hoped they would be more like a 500 level item! Make the 'weekly' work worth breaking my set bonus for. So, can I gain only one ilevel in 4 posts? We'll see.. AMR suggested upgrades (#2 would add .5 an ilevel) could be small enough to push me over to 500.! 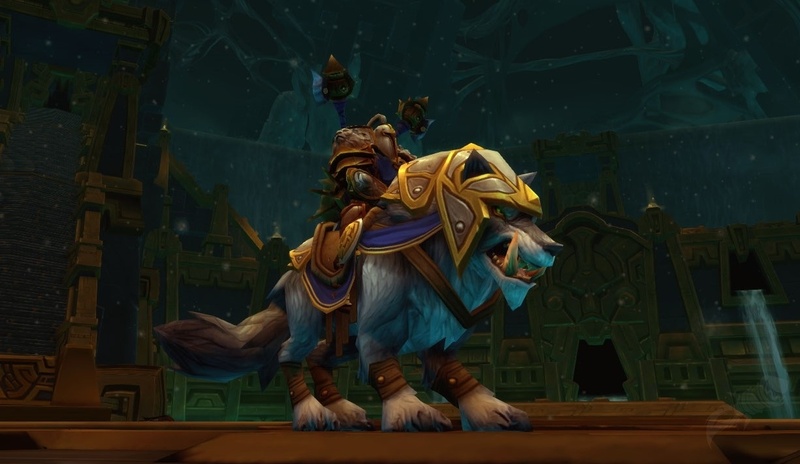 Another way to obtain a Deathmist look-alike set! 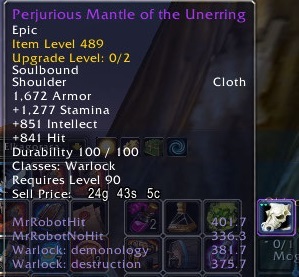 3 upgrades (2x main hand, 1x trinket2) later and still haven't hit 500 ilevel. My calculations say I should be at 499.875 so?? Guess it's not an average, but absolute. Looks like I need 1 more upgrade should push me over the 500 limit.